Nasi Kuning is an Indonesian rice dish. 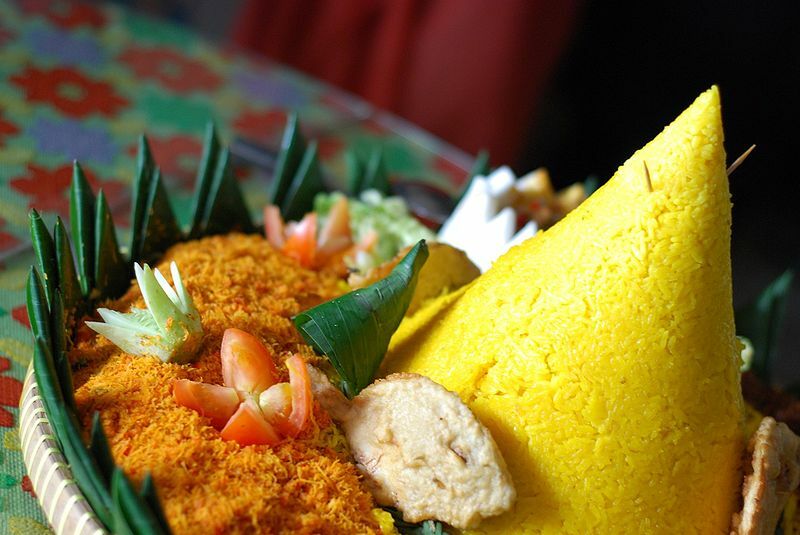 It also comes in a form of a cone called a tumpeng and is usually eaten during special events. The rice is cooked with coconut milk and turmeric, hence the name nasi kuning (yellow rice). Left: Nasi Kuning served with Serundeng (relish of grated coconut and spices). The rice is to symbolize a heap of gold, so nasi kuning is often served for parties, or opening ceremonies, as a symbol of good fortune, wealth and dignity. It is usually served with a variety of side dishes. Shredded omelet, serundeng (relish of grated coconut and spices), sambal goreng (fried tempeh and potato caramelized in spicy sauce), ayam goreng (Javanese-style fried chicken), perkedel (potato fritters) are the most common side dishes found in nasi kuning. More elaborate nasi kuning would include fried cow's brain, fried cow's lung, beef and seafood. The top of the tumpeng would normally be given to the most senior of the attendance.